No one calls Winsor McCay an early twentieth-century modernist or links him with the Armory Show. After all, he was a newspaper cartoonist and illustrator for vaudeville and variety shows. He was, by all contemporary accounts, a wonderfully accurate draftsman and something of a phenomenon in the speed with which he created a finished product. Known in his day for the flourishes of his strips, McCay was inspired by fin de siecle Art Nouveau. Yet McCay shared with the early twentieth-century modernists a cultural orientation. Instead of one way of seeing things, which was the typical impulse in the nineteenth century, the modernists and McCay often embraced many ways as valid and saw truths as multiple. McCay probably knew little of the New Physics, in which the solidity of the physical world and universality of the concepts used to apprehend it were challenged at seemingly every turn. 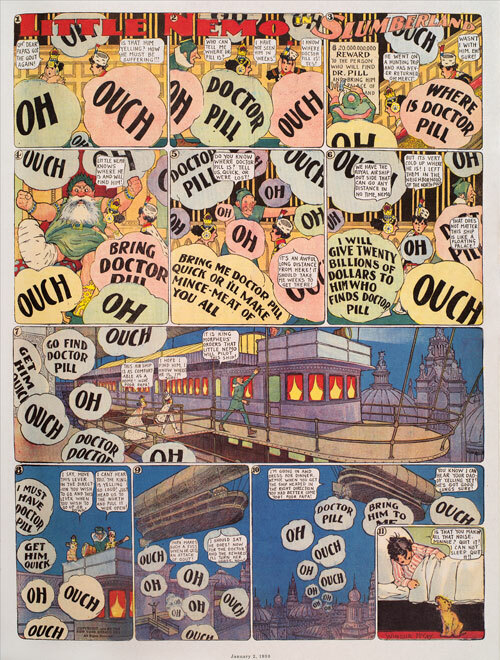 His famous strip, Little Nemo in Slumberland, however, made concrete the multiplicity of the physical world. In one sense, the comic, which ran from 1905 to 1914, was a formula entertainment that he explicitly designed for “little folk.” Nemo falls asleep, has a series of dreams–some appealing, others terrifying, and wakes up in the last panel. McCay’s triumph was the imagination that he displayed in presenting those dreams. He broke his page into forms and shapes that varied from strip to strip, ranging from as few as five to as many as twenty panels. He would tell stories with cinematic techniques, shifting vantage points and propelling the reader into the panel itself. McCay’s manipulation of perspective, his attention to the pleasures of the decorative, and his ability to endow things with life gave his strip an enchanted quality of near infinite possibility. Small wonder McCay became the premier animation artist of his day (his Gertie the dinosaur was a favorite of nickelodeon audiences) or that Walt Disney and Federico Fellini hailed him as an inspiration. Daniel H. Borus, Twentieth-Century Multiplicity: American Thought and Culture 1900-1920 (Lanham, Maryland: Rowman and Littlefield, 2008). John Canemaker, Winsor McCay: His Life and Art (New York: Harry N. Abrams, 2005).